I love to cook and I am an avid reader of various cooking sites. One of this sites is Cooking which is the New York Times site. For me reading about the James Beard Awards is mandatory. I was richly rewarded by this article written about this year’s award winner for Best Pastry Chef. And to “sweeten” the pot, I am also attaching her award winning recipe. Enjoy! BIRMINGHAM, Ala. — Dolester Miles bought a pair of black slacks and a sequined blouse to wear to the James Beard Foundation awards ceremony in Chicago this month. She wanted to look nice, even though she didn’t think she was going to be chosen pastry chef of the year. She was up against some heavy hitters. There was Margarita Manzke, whose desserts at the bistro République were declared “terrific” by Jonathan Gold in The Los Angeles Times, and Meg Galus of Boka in Chicago, whose recipes made use of toasted milk and the funk of fermented black lime. Why in the world would the 600 or so Beard Foundation voters pick a self-taught, 61-year-old cook from a small steel-making town who has spent the past 30 years making Southern-influenced desserts for the same Alabama restaurant? Ms. Miles, who prefers you just call her Dol, had been nominated twice before, so she was used to losing. So was Frank Stitt, who had hired her 36 years ago to make salads at the Highlands Bar & Grill. For the 10th time, his place was up for restaurant of the year. Instead of planning acceptance speeches, the team from Alabama used the trip as a nice break. The night of the awards, Ms. Miles put on her new outfit, slipped on a favorite pair of earrings (she has a thing for earrings) and took a seat in the Lyric Opera House. When her category came up, she was as calm as a cat. “I’m waiting for them to call out one of the other names,” she recalled during an interview here in Birmingham. Instead, she heard hers. “At first I couldn’t move. I was just in disbelief,” she said. She made it to the stage somehow, barely holding back tears. She thanked the Beard voters. She thanked Frank Stitt and his wife, Pardis, and her pastry crew back home, adding, “That’s all I got to say.” She was done in less than 30 seconds. The win, along with the Highlands’ victory as restaurant of the year, was part of a sweeping adjustment to the Beard Foundation lens. More women and minorities won this year than ever before, and many of them weren’t from the kinds of restaurants that get a lot of media attention. The radical shift was rooted in a cultural moment. The restaurant business is reckoning with issues of gender and race in unprecedented ways. To be sure, there has been plenty of debate over whether this year’s awards were an anomaly driven by social pressure or the start of an enduring shift in what the James Beard officials — and perhaps diners — consider the elements of a great restaurant. Still, amid all the hand-wringing over politics and privilege, it was Ms. Miles’s win that somehow captured hearts. In her own small way, she was like Meghan Markle’s mother, Doria Ragland, at the royal wedding: a secondary character in a larger, predominantly white narrative who emerged as an African-American beacon. Bill Addison is the national restaurant critic for the website Eater and the chairman of the Beard Foundation’s restaurant-award committee, which develops the list of nominees but doesn’t know the winners until the ceremony. That night in Chicago, he said, he cried “big, salty tears” when he heard Ms. Miles’s name. Mr. Addison was moved because his committee’s effort to put forth a more diverse slate of candidates had paid off, and also because he, himself a former pastry chef, loves Ms. Miles’s peach cobbler with a passion that borders on fanaticism. John T. Edge, the food writer and historian who directs the Southern Foodways Alliance, has long been a devoted fan, too. Like many, he came to know Ms. Miles by way of her coconut pecan cake, a rich cousin of a traditional Southern coconut cake, dressed up in Chantilly cream frosting. Although she now is making 60 a week — double what she made before the award — it is by no means her favorite dessert. She prefers something with the tang of citrus, like her lemon meringue tart. But she doesn’t eat many sweets. She was diagnosed with diabetes 10 years ago, and does her best to consume them judiciously. Ms. Miles was taught to bake by her mother, Cora Mae Miles, who died five years ago, and her aunt, Queen Ester Harris, 85, who spent a career cooking at the high school cafeteria in Bessemer, a small town about 15 miles southwest of Birmingham whose nearby iron and steel plants once pulled many African-American families into the middle class. Mrs. Harris is the kind of woman who might make nine cakes at a time and deliver them to people in nursing homes. It was a good birthday if you got one of her cakes. Her brown sugar poundcake was a favorite when Ms. Miles was growing up. Unlike a cadre of Southern women who find power in refusing to share a recipe, Mrs. Harris was always generous with her knowledge. Family being family, Ms. Miles did not escape some teasing when word of the award made it to Bessemer. “I said, ‘I’d accept it if you said you were the best in Birmingham, but not America,’” her aunt said. A cousin took it one step further: She looked online and saw how much Ms. Miles’s desserts sold for at the restaurants. “She said she is going over to eat one of them $9 slices of cake because she wanted to know what does a $9 slice of cake taste like,” Mrs. Harris added. One day in 1982, Ms. Miles heard about a new restaurant that a young chef named Frank Stitt was opening in Birmingham’s progressive Southside neighborhood. Mr. Stitt had left the South to pursue an education that took him to Tufts University, the University of California, Berkeley, and eventually France, working as the food writer Richard Olney’s assistant. Mr. Stitt, who is white, came home and started something that would change the face of Birmingham. She started as the pantry chef. She and Mr. Stitt still laugh about the early days, when he would send her to the store for leeks and she had no idea what she was looking for, or how he urged her to taste arugula and watercress. He soon recognized her talent with butter and sugar. Over the years, she has learned to interpret Mr. Stitt’s unwavering devotion to seasonality and his vision for the kinds of desserts he wants at each of his restaurants: a provincial French approach at his Chez Fonfon, Italian sweets at Bottega and elevated Southern offerings for the Highlands Bar & Grill. As a result, she can toggle from chocolate pots de crème to polenta poundcake tiramisù to blueberry cobbler with ease. Some of it is just managing Mr. Stitt, who on a recent Monday came into the pastry kitchen with a page torn out of a hospitality magazine showing off a dessert inspired by Italy’s Friuli region. He liked the way it had been plated, in a dramatic horizontal stripe peppered with pistachios and kumquat slices. “Maybe we could do that with strawberries,” she said. She comes up with her own ideas, too. She reads cookbooks, and found inspiration in the royal wedding. She got up at 6 a.m. to watch the whole thing, and made special note of the wedding cake — a spongecake stunner with elderflower syrup and a curd filling made from Amalfi Coast lemons. “I might have to try something like that,” she said. But don’t expect her to make a big deal about her work. Ms. Miles is so shy that she acquiesced to her first interview only two years ago, after the magazine Southern Living persisted. But she is easing into her newfound celebrity. “She’s just blossoming,” said Ms. Stitt, who manages the front of the house in the Stitt empire. Dessert orders are way up at the restaurants, as are reservations, she said. A couple drove all the way from Minneapolis the other night just to eat at the Highlands because of the Beard win. But the surge of interest in a steady, understated Southern restaurant with a French sensibility may be broader than one award. At a time when stark political divisions are driving headlines, a place like the Highlands and the solid appeal of Ms. Miles’ desserts have a new luster. “There been kind of a reckoning, especially after this election, of all of us recognizing our own privilege and what led us here, but also a recognition of the importance of the intimacy of shared meals,” said Ava Lowery, who teaches film at the University of Mississippi and who made a short documentary about Ms. Miles for the Southern Foodways Alliance. Food, she said, can be a subversive vehicle for social change. “I would like to think that what we’re about is integrity and respect and quality and pursuit of beauty in our work and for our guests,” he said. But a person can overthink these things. Sometimes, dessert is just dessert and a job well done is its own reward, Ms. Miles said. Heat oven to 350 degrees. Grease two 9-inch round cake pans and line the bottom of each with parchment paper. Grease the parchment paper, then dust with flour, tapping out excess. Finely grind the coconut in a food processor, then transfer to a bowl. Add pecans to the food processor, along with 2 tablespoons sugar, and finely grind them. In a large bowl, sift together flour, baking powder and salt. Stir in coconut and pecans. In the bowl of a mixer fitted with the paddle attachment, beat butter, cream of coconut and the remaining sugar on high speed until light and fluffy, about 4 minutes. Add eggs one at a time, mixing well after each addition and scraping down the bowl as necessary, then beat in coconut extract. Add the flour mixture in 3 batches, alternating with the coconut milk, starting and ending with flour mixture. Divide batter between the pans and smooth the top of each with a spatula. Bake until cakes are golden and a tester comes out clean, 30 to 35 minutes. Let cakes cool in the pans on a wire rack for 30 minutes. Run a knife around the edge of each cake, invert onto rack, and remove the parchment. Let cool completely. Meanwhile, make the filling: Place egg yolks in a small heatproof bowl and set aside. In a saucepan, combine condensed milk, butter and cream of coconut and cook over medium-low heat, stirring constantly, until hot, about 4 minutes. Whisk 1/3 of the hot milk into the egg yolks. Transfer egg mixture to the saucepan of milk and whisk constantly over medium-low heat until mixture has the consistency of pudding, about 4 minutes. Do not let the custard get too thick. Transfer to a bowl and stir in the shredded coconut. Let cool completely. Make the simple syrup: In a saucepan, heat sugar and 1/2 cup water, stirring occasionally, until sugar has dissolved. Remove from heat. Assemble the layer cake in a pan: Cut each cake in half horizontally. Place one layer in the bottom of a 9-inch cake pan, moisten the top with 2 to 3 tablespoons simple syrup and spread 1/2 cup of the coconut filling in a thin, even layer with an offset spatula. Repeat to make 2 more layers of cake and filling, then place the last layer on top. Refrigerate cake for about 1 hour. To unmold, run a spatula around the edges, invert a cake plate over the top, and flip the cake over onto the plate. Make the icing: Whip the cream with the confectioners’ sugar and coconut extract until stiff peaks form. 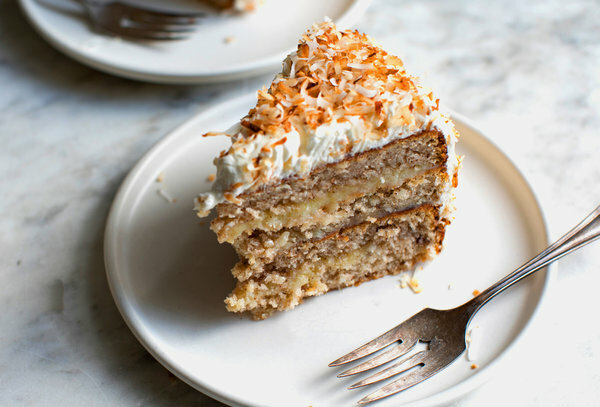 Spread on the top and sides of the cake and sprinkle with toasted coconut. Refrigerate until ready to serve. Please feel free to leave a link to an article you have written about an inspiring woman. What an inspiring lady & post Bernadette! And the recipe sounds delicious as do the other treats mentioned! Yum! Goodness what a heartwarming winner Bernadette. Imagine a peach cobbler described as making “my soul burst into four-part harmony.” Wonderful. The words are almost as magical as the cake and cobbler. Bernadette, thanks so much for the post.Much thanks again. Really Cool. and that Coconut Pecan Cake😍! 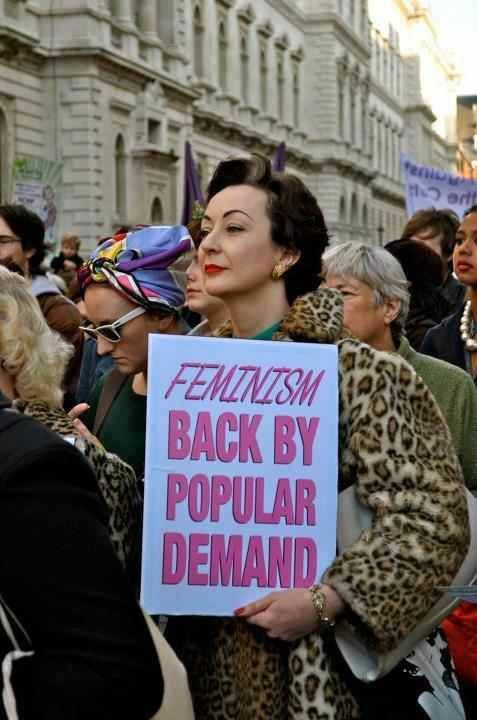 Your words so resonate with me as I am doing research for Feminist Friday. Dolester is such a wonderful example of your words. She really is, Bernadette and I am humbled that my words have that effect on you. I truly enjoyed learning about her and knowing that it still has never gone to her head. I love the look of joy on her face as she is putting out her cake. True joy from true vocation. I am so happy you highlighted this article.I just bookmarked the Times site a couple of weeks ago. Oh, and I think I have to make that Coconut Pecan Cake! What an amazing story and the James Beard-just wonderful. Most fascinating post, Bernadette. She is so inspiring and her cake looks delicious. Bernadette, thank you ever so for you post.Much thanks again. This is a delightful article, Bernadette. A successful baker is definitely a story I enjoy. Oh my this is a wonderful post! How exciting to hear about this woman and her desserts!